Depending on your perspective (whether you are based in France living off a UK based salary/pension, buying a property or selling up to return to the UK) this graph will either be very depressing or great news…. 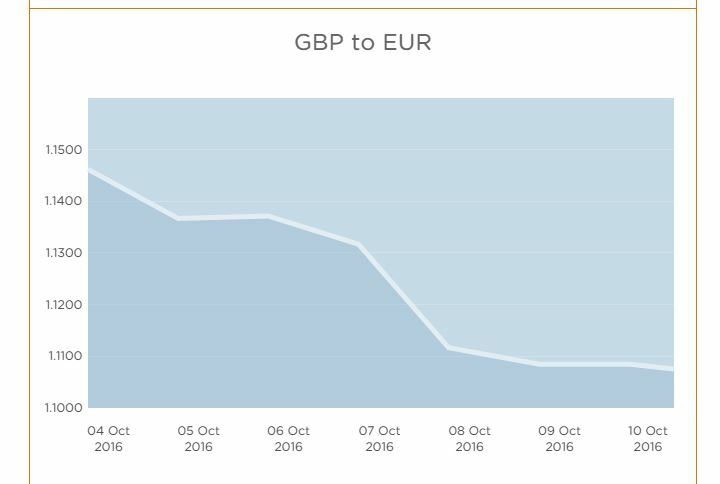 It’s been a very rocky week for Sterling to say the least and we’re currently sitting around the £1/€1.11 mark. But If you’re selling property in France, or earn in euros and send money back to the UK to cover mortgage payments/children’s university costs etc……now is a good time to really consider a fixed forward contract. You can book an amount at this rate and hold for up to 12 months. To put this into context if you bought your property for €200k in 2006 when the rate at that time was around €1.45, and sold today for the same amount in euros you would gain approx. £42,000 MORE than it cost you in sterling to buy back then!!! Contact local representative, Fiona, for more info or a live quote on fiona.w@currenciesdirect.com.